The QDHP provides an independent, confidential, colleague-to-colleague support service to assist doctors and medical students. Staffed by volunteer senior GPs and counsellors with experience in Doctors’ Health. When you call the Helpline, an agent at our paging service will answer your call. They will ask you for a name and contact number on which our GP on-call or counsellor can reach you. Please note that the Helpline is not a crisis line. 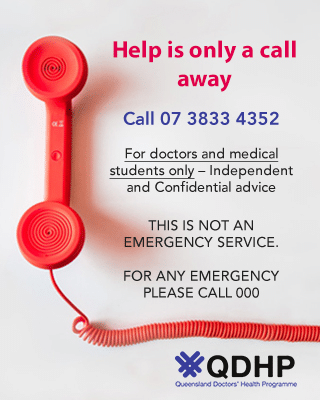 QDHP assists doctors and students by providing a first point of contact to discuss their concerns and to provide advice, in a non-judgmental and confidential space. 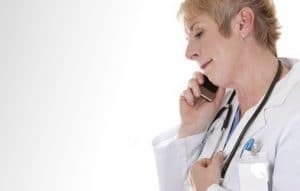 This telephone helpline is staffed by senior General Practitioners and Counsellors, supported by specialists experienced in assisting colleagues suffering from a wide range of health or stress-related problems. The QDHP does not provide clinical treatment. Its role is to assist those calling so that they can access the right care and help them make appropriate arrangements for treatment within existing services, when required. QDHP’s service is provided at no cost to the practitioner because our helpline is staffed by volunteers. For some callers, the problem may be effectively addressed with a single call. If subsequent treatment is provided by other practitioners, then costs are decided in the usual manner, between the person seeking treatment and the provider. Having the opportunity to speak with a colleague or counsellor who understands doctors’ health issues and the many demands and stresses of balancing work and lifestyle as a health practitioner, can be very helpful.